Terrorists rain rockets on Ashdod, hitting city twice and wounding several people. 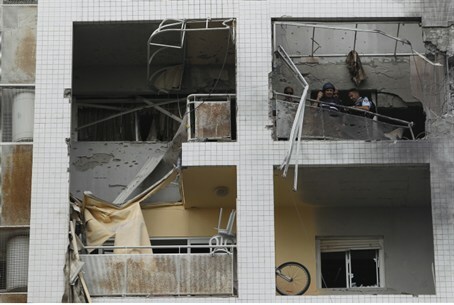 Gaza terrorists fired a barrage of rockets at the city of Ashdod on Tuesday evening. Four rockets were shot down by the Iron Dome system, but another two hit the city. One exploded near a residential building, lightly wounding five people. The attack sent an additional 13 people into shock. Victims of the attack were taken to Kaplan hospital in Rehovot. A second rocket struck near a commercial building. At least one woman was wounded in the attack. The victim of the second attack is in light condition. In addition, a young man was lightly wounded when he hit a glass door while running for shelter. He was taken to hospital with wounds to the face and upper body. In the aftermath of the latest attacks residents of the city called on the government to take out Hamas’s attack capabilities.